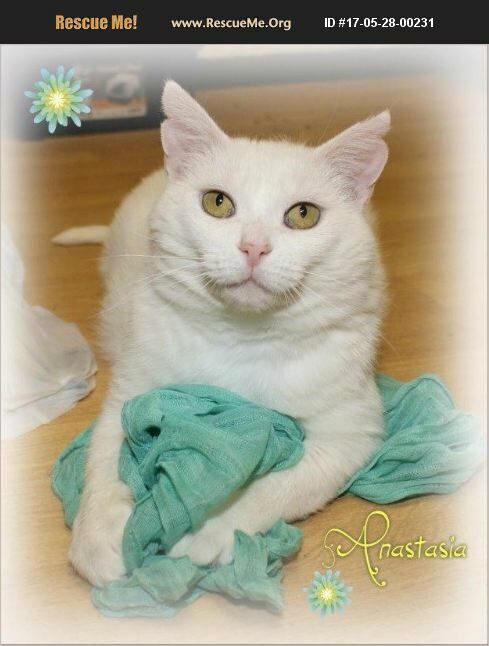 Anastasia is a beautiful all white female. She is very friendly. She was a mom cat, and all of her babies got adopted. Now it is her turn! She gets along with other cats and is spayed. She is current on vaccines and tested negative for FIV and Leukemia. She had very pink sore ears when she arrived to us so she had little bits off her ears taken off for samples that were sent away to be tested and it is not cancerous but rather severe sun damage. We do not recommend she be allowed on a sun porch or to sit in a sunny window for long periods of time.